His first prize shearling ram is by a home-bred tup whose own father was acquired from North Craven breeder John Kelsall, of Cold Cotes, Clapham, and has been utilised to great effect over the past four breeding seasons by the Coates family, who share the ram – the champion Dalesbred at the Great Yorkshire Show two years running - in partnership with fellow breeders Richard and Mick Carr, of Horton-in-Ribblesdale. Richard Close is pictured right with his Skipton Dalesbred shearling ram champion, joined by David Wilson and the reserve champion, co-judges Rachel Brown and John Carr, and trophy presented Royston Baxter. The victor, the first for the Close family at the Skipton showcase – the ram earlier won its class at Pateley Bridge Show this year- was tapped out by co-judges John Carr, 26, of Horton-in-Ribblesdale, and 18-year-old Rachel Brown, from Kirkby Malham – the Association has a tendency to use young up-and-coming adjudicators to give them valuable experience in the show arena. Mr Close was presented with the Royston Baxter Trophy, awarded annually by the former Skipton Auction Mart foreman, who lives locally in Steeton. He first donated the silverware in 1994. “I have been trying to win it ever since,” said Mr Close, whose own grandfather Joe first established the family’s Dalesbred flock and was a founder member of Dalesbred Sheep Breeders’ Association. Mr Close, who was accompanied by his son Matt, is the Association’s current vice-chairman and saw his title winner, out of a ewe sired by a tup from John and Jean Bradley’s flock in Giggleswick, go on to sell for 150gns to co-judge Rachel at Accraplatts. The Close family was also responsible for the day’s top price of 300gns with a second shearling, sired by the same Kelsall ram, out of a ewe got by a Dawson tup. It attracted spirited bidding at the ringside before finding a new home with V Verity and Son, of Whitmoor Farm, West End, Summerbridge. It was the Association’s chairman, David Wilson - he farms around 1,000 Dalesbreds with his father Michael at Crimple Head Farm, Beckwithshaw - who picked up the reserve champion’s rosette with the second prize shearling ram, by a home-bred 4 shear tup who has to date had three outings on the Wilson flock, and has been responsible for a number of previous show winners. Their latest frontrunner, which won the Dalesbred class at this year’s Ripley Show, was out of another Bradley family-sired ewe and sold for 200gns when finding a new home on Silsden Moor with Alan Fothergill. 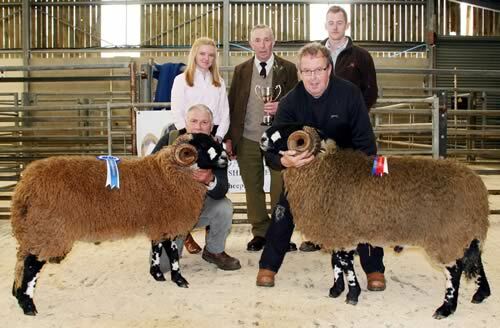 The Bradleys themelves achieved 200gns with a shearling ram by a Frank Brennand tup, out of a John Harrison-sired ewe. It fell to the Leeming family in Cononley. R Jackson & Son, of Town Head Farm, Horton-in-Ribbledale, chipped in with a 160gns shearling ram claimed by J Fisher, of Withnell, Chortley. The third prize shearling ram came from Kevin Wilson, of Hewness House Farm, Blubberhouses, and made 80gns when joining MJ Holmes, of Hurstwood, Burnley. Multiple past Skipton champions, father and daughter Godfrey and Alison Haygarth, of Aigden Farm, Wigglesworth, were responsible for the red rosette-winning aged ram, a first-time shown 3 shear got by a Ryder family tup from Haverah Park, Harrogate. It sold locally for 150gns to BJ&L Sutcliffe in Thorpe. In what proved a good show of rams displaying plenty of power and bone, pedigree shearling tups sold to an overall average of £102.14 per head (2016 £101.89), with six aged rams averaging £89.25 (£94.50).